IdentoGO is an identity verification company and an official partner of the TSA. They provide the identity verification required for TSA Pre-Check approval. In order to expand reach, Anvil launched a Facebook campaign aimed at reaching potential travelers. The ads led to a significant number impressions but had low engagement rates and the highest CPA of all other marketing channels. Working in conjunction with IdentoGO, Anvil refreshed creative and messaging. Targeting focused on key cities with large airports, each having their own campaign. Within each campaign, multiple ad sets were created that targeted audiences by interest, age, and behavior. Anvil lowered the CPA each month as the targeting was tightened and refined. By the end of 2016, Facebook’s CPA was the lowest of all marketing channels. 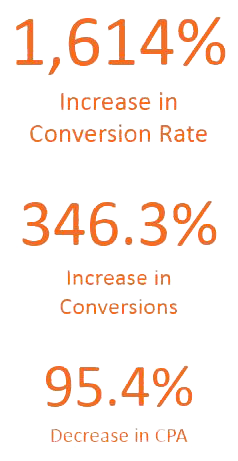 The campaigns’ engagement rates increased by 80.5% and had the second highest conversion rate of all channels.